Seven leading tour operators from India have been visiting Laois and Ireland this week, on a fact-finding tour organised by Tourism Ireland in conjunction with Fáilte Ireland and Tourism NI. 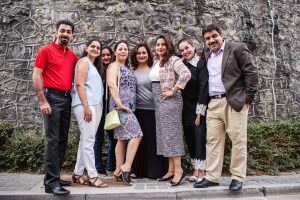 The tour operators – based in the cities of New Delhi, Mumbai, Ahmedabad and Chandigarh – are here to experience at first-hand what Laois and Ireland’s Ancient East have to offer Indian holidaymakers. The objective of their visit is to encourage them to extend the Ireland content of their existing programmes or to include Ireland for the first time in their 2018 programmes. One of the highlights of their time in Laois was a site inspection of, and lunch at, Castle Durrow. Indian tour operators with Kavya Chawla, Tourism Ireland (third right), during their fact-finding visit to Ireland.